This blog is intended to be about what I am doing; and for sharing my favourite Quotes. I was looking through my old folder and files to see what I could get rid of and came across this brilliant idea for children and grand-children. Don’t ask where I found it or why I kept it; but I feel I want to share it with my readers. What a brilliant way to grow beans/peas or whatever is a climbing growth. The kids will have lots of fun in their tepee. 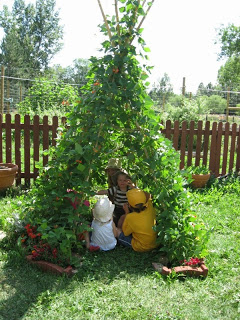 Plant a bean tepee that’s large enough for children to play inside. Plant a blackberry patch. Have a bushy area? Cut the bottoms of the bushes up three or four feet, so that it turns into a living fort. Make pathways out of paving stones or wood chips. Put a row of stumps just about anywhere. Get a pile of bricks for kids to build stuff with, or a pile of river-rocks. A stump cut into 1-inch rounds make great stepping-stones, pathways, plates, boats for mice, and many other magical things. But most of all – just do it! The more time you spend outside, the better everyone feels. Any corner of your yard that’s not currently being used can be infused with energy by putting up a tent, tying a tarp overhead, planting a raised garden bed, piling up rocks, or anything that generates interest. Be sure to bring snacks, and drink lots of water, and then put out a picnic blanket and lie back in the shade while your children explore. This entry was posted in Gardening, Just Fun, Tips and tagged Fun, Gardening, Information, Tips. Bookmark the permalink.